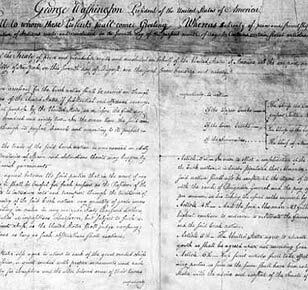 Secret articles appended to the Treaty of New York (1790), under which President George Washington contracted with Creek Indians to return runaway slaves living among the Seminoles. National Archives. *Creek attempts to recover the Black Seminoles would lead to six decades of inter-tribal strife, culminating in one of the climactic events of John Horse's life and Black Seminole history.